The app is to support the website’s features of creating data using one of four methods: Wild key, Wild form, Wild image and Wild map. The website platform (Wild Knowledge) is a mobile toolkit for people to record information in the field and engage with location based information. You can use the website platform to create useful data collection forms and export these to the app where the user can then collect the information via a mobile device out in the desired location. Individuals or schools can sign up to the portal and make their own content. Please note that this is slightly restricted unless the user would like to subscribe to the portal. The app does not work as a standalone feature unless the user has signed up to the website account. The rubric score given is based on the app and website platform as a whole. Before the WildForm application can be used the user must sign up to the Wild Knowledge portal and create an account. We suggest that the initial user should be the account administrator although other users can be added. It would beneficial if additional users could be added such as class members without further email addresses. Students could be issued with a code to log into the portal and access class forms that have been created. WildKey – This option enables the user to create and mobilise their own decision trees or keys. The website offers a great video demonstration, which is a little blurred, to help the user. Here the user can create a customised decision tree for any subject. We love the fact that the interface is very easy to use and images can be added. Once this is complete it can be uploaded to the mobile app for you to access. This is ideal for students who are for instance identifying birds, insects or any wildlife when out on a field trip or simply in the school environment. The possibilities are endless. Our only concern is that the process to set this up is quite complex at times. 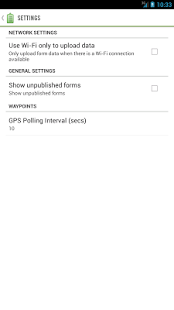 Younger students may have difficulties setting up this option and are more inclined to use the app to collect data from a WildKey that has already been set up. WildForm – This is probably one of the better options on the platform and has many users within the curriculum especially when creating questionnaires. This option allow the user to create and mobilise their own forms. Once again a video can be seen to help with instructions. The form allows many different options such as categories for age and subject. 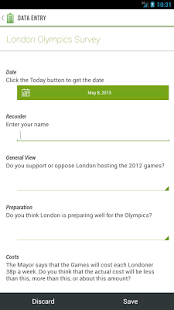 I great feature is that an image can be added to the form so it can be easily recognised in the mobile application. Many different types of fields can be added such as a drop down list, a radio button, checkboxes, image lists, quiz questions and much more. We see many users for this option within the curriculum and love the fact that when the user creates a field it can be seen on the mobile graphic to show you how it will look on the device. We can envisage students creating questions that can be collated on their mobiles in the classroom but also whilst out on field trips. WildMaps – Again this option has many opportunities to enhance teaching and learning. WildMap enables the user to create and mobilise their own interactive trials and use the tool to create maps and points of interest. Unsubscribed users are limited once again in this option. A map can be created of a designated area and Designated Interest Points (DIP) can be added along the way. These points can be enhanced by adding images, audio, web pages, links and questions for the user as they come across the designated interest point. This is an excellent tool and although it may take some thought and time to create the trail the outcome displayed on the app is very enjoyable. WildImage – This option is a toolkit where you can create and mobilise your own interactive pictures or diagrams. Sadly there is no user video here. The tool can sued to create images that can used via the WildImage app. Once again the options are detailed here where images, audio and questions can be added. This is great for importing simple maps or trials for younger uses rather than a detailed ordnance map. 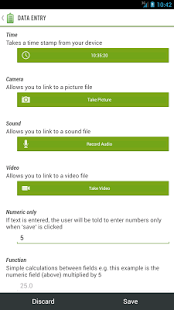 Once any of the above options have been created the platform allows the content to be shared and uploaded via the app. Once the app is opened the user has to sign in and the forms are downloaded. The form should be easily identified by the picture or name given. Choosing a form will display the description and choosing the ‘+’ icon will enable you to add a record. The form can be filled in and the data can be uploaded or deleted. The app is very simple is design and very easy to use. Where the website portal comes into its own is when the data has been collected. Under ‘My forms’ the user can see the records collected in real time. Here the data can be shared in great depth, edited or deleted. Every possible option has been thought of here and we love the fact that you can export to Flickr, search for data, export in excel, print and create 3 types of presentation chart. The charts are very well presented and could be in professional reports and presentations. It would be good to be able to save the chart as an image file here. It is very clear that a lot of thought and design has gone into the Wild Knowledge platform. Whilst the subscription may but users off there is still plenty to offer in the free option although somewhat limited at times. A trial run might be a better solution here. The app that supports the platform is essential for mobile data recording and this application and platform together make it an excellent toolkit that could be used for both educational purposes as well as business. Although the setting up of the forms and details can be time consuming the forms offer a fun way of collecting data and creating interactive maps and trails. The app does not work as a standalone feature unless the user has signed up to the website account. The review given is based on the app and website platform as a whole. Replace your paper forms and clipboard with WildForm an ideal mobile application for undertaking mobile surveys, inventories or quizzes. Download your forms to your phone* and use anywhere. WildForm can be used with a live internet connection or can be used offline, with any saved information being uploaded when you have a connection again. Take advantage of the multifunctional features of your phone, such as GPS, camera and microphone, to gather much more interesting information than just plain text. Uploaded data can be visualised as maps, charts and reports and can be kept private, or shared with the community as open projects. If your ideas are really good we may partner with you and turn your WildProject into a stand alone app.